Since the 1970s there has never been a time when the vanguard of the revolution, the Party-Front’s supporters, have been absent from the cities and mountains of our country. At times when fascism least expected it, hundreds of actions were carried out. While fascism tries to convince itself that no revolutionaries can live here, they have shown the entire world that the Party-Front’s supporters can live and be vanguard fighters of the revolution in every place where the people are, on every piece of Anatolia’s land which we see as our native land. They have won, they have been defeated , they have died, they have killed. At the very moment that they said they had annihilated and wiped us out, our existence was confirmed. They have written the history of the revolution in blood – not with empty words, but with actions and readiness for sacrifice. The mountains of the Aegean were quiet and peaceful. They were a place where fascism could arm itself and live. Everything was under its control, it said . But with soft and modest steps, the supporters of the Party-Front climbed onto the mountains of the Aegean once again. The war which began in the cities spread into the major metropolitan centres . While the struggle developed again in numerous cities in Anatolia, it spread to Kurdistan in Turkey, to central Anatolia, the Black Sea region, the Taurus and the Aegean. The Aegean, the land of revolutions, bears witness to the vanguard of the Party-Front supporters who follow the uprisings by the BÖRKLÜCES (translator’s note: rebels in the Aegean who rose up against the Ottoman Empire in the Middle Ages). It can be said that in the revolutionary history of the Aegean the Party-Front supporters are the heirs of the Börklüces. 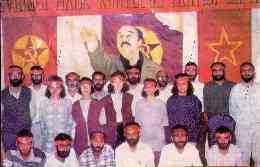 Following the legendary acts of resistance created by the urban guerrillas Faruk, Olcay, Kahraman, Hamiyet and Ali Riza Kurt (translator’s note: Devrimci Sol and Party-Front martyrs in the area in the first half of the 1990s), the war has spread to the mountains of the Aegean. The existence of the Party-Front in the mountains of the Aegean was a profound shock for the Susurluk state. For ten days they were in a great panic. A small guerrilla unit caused fear and trembling among the state. The Gölgeli mountains were surrounded by thousands of soldiers and special team members from the adjacent Denizli area who were equipped with tanks, armoured cars and all kinds of heavy weapons. Deep down, what they feared was not the existence of a small guerilla unit, but the strength of the demand for revolution and the Party-Front, which under no circumstances will back off from making this demand for revolution. The existence of a revolutionary organisation which, in all corners of the country, in the cities, in the mountains, seeks to unite and bring into the struggle all our peoples without regard to nationality or creed, is the most dangerous force as far as the state is concerned. Now the Party-Front, which it could not erase through annihilation and repression, is also to be found in the mountains of the Aegean. The enemy concentrated its forces here in the mountains of the Aegean too – its army, police, media, armoured vehicles, cannons and mendacious news items. Now the people’s war against the oligarchy would continue here. The history of the Aegean is full of uprisings. The history of the Aegean is the history of heroism. In this history there was no betrayal of the people. It contained within it heroic martyrdom and resistance. But there was no talk of capitulation and submission. Our fighters Erhan Yilmaz and Mehmet Yildirim, who were surrrounded at the foot of the Gölgeli mountains in Balkica village on November 29, remained true to this history. Hostile forces, thousands of soldiers and police with heavy weapons surrounded them. The fighter is connected to life. This connection with life is the connection with his or her people and organisation. In order to achieve the revolution, he will live and fight for his people. But he is conscious that surrendering without fighting would mean not living but betraying the revolution and his people. Basically it is this moment when against a thousand enemies the justice of the people, the voice of the people comes most to the fore, if necessary by putting one’s own life at stake. They did not hesitate in the slightest. The enemy surrounded them with thousands of soldiers. In this moment the countryside dwelling in Balkica was the Party- Front. The Party-Front and the revolution were reflected in the personalities of Erhan and Mehmet. The eyes of the whole people were turned on them. The seeds of the revolution in the mountains of the Aegean were sown. The seeds would ripen and grow. They were to show that the guerrillas can exist in the mountains of the Aegean and that the Party-Front cannot be defeated. “Surrender”, shouted the Susurluk generals with their thousands of soldiers, armoured vehicles, cannons, believing themselves to be strong. The guerrillas answered with their weapons. The little rural dwelling in Balkica bore witness to the heroic resistance of the two Party-Front supporters in the mountains of the Aegean amid thousands of bullets, rockets and mortar bombs. The Aegean, with its Turkmens, Greeks, Jews, Kurds, Cherkess, Georgians, Alevis, Sunnis and Christians, which is a forest of fraternity, had never seen such resistance. Two supporters of the Party-Front challenged the enemy army amid the thousands of bullets and explosive projectiles. They called out “We are the Party-Front, we are DHKP-C, we do not surrender, you cannot make us surrender. 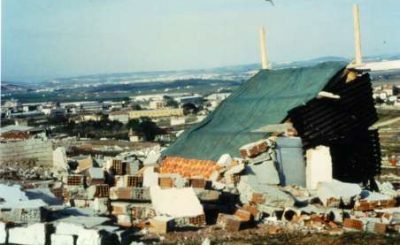 Supporters of the Party-Front do not die.” For precisely twenty hours it was not possible for the enemy to silence two Party-Front supporters in a rural dwelling. Precisely twenty hours. Twenty hours of sleeplessness, hunger and cold. The two fighters of the Party-Front never let their slogans, marches, revolutionary agitation and their weapons fall silent. The enemy was confused, the people were confused. The people of the Aegean got to know the Party-Front in the mountains of the Aegean with their heroic resistance during the enemy encirclement. From now on, the Aegean will talk of this resistance. The enemy was powerless, immoral and without a way out. With thousands of soldiers and heavy weapons it could not make two supporters of the Party-Front surrender. For all its thousands of soldiers it could not even get close to the country dwelling where the two Party-Front supporters were located. Moreover, they suffered losses. Under a hail of bullets and shells two fighters of the Party-Front killed one of the enemy and wounded two others. In the face of the creativity of the two Party -Front supporters, the enemy, who trusted in using thousands of soldiers in an encirclement, suffered a complete defeat.The enemy was nevertheless weak and condemned to defeat, for despite its thousands of soldiers and heavy weapons it stands for exploitation, tyranny and immorality. They can murder thousands of our fighters but those who are in the wrong historically and politically, those who are the enemies of the people will sooner or later be defeated. They were defeated at the very moment they claimed to be victors. The rural dwelling in Balkica was burned to the ground with mortars and rockets before the eyes of the entire world. The fire which lit up the Golgeli moutains in Balkica is not the fire of a rural dwelling, but rather the fire of resistance which will spread in the mountains of the Aegean. The fire lit by two supporters of the Party-Front will never be extinguished by any force. All the enemy got were the charred corpses of the two Party-Front supporters. Who won, and who was defeated? Their thousands of soldiers and tonnes of heavy weapons were still not enough to make the fighters give in. For exactly 20 hours. Those who surrounded the Party-Front fighters experienced defeat, minute for minute, hour for hour, before the eyes of the entire world. They were afraid, were egoistic and devoid of all conviction. He was born in 1976 in Bismil district near the city of Diyarbakir as the son of a poor Turkmen family. (Translator’s note: the Turkmen of Anatolia are a distinct Turkic ethnic group, who were nomadic until the 19th century and who often played an important role in rebellions against Ottoman authority. They are not the same people as the Turkmen who live in the former USSR republic of Turkmenistan, northeastern Iran and northwestern Afghanistan.) He spent his childhood in the village. Since his family was poor, he had to work at various trades in order to be able to continue through middle school and high school. In his high school years he came into contact with revolutionary ideas because of his anti-system attitudes, since he had personally experienced the system’s injustice and tyranny. While in the beginning he already sympathised with the revolutionaries in a general way, the resistance of April 16-17, 1992 influenced him deeply. He got to know the ideas of Devrimci Sol. When he began his studies in Balikesir in 1993, he belonged to Devrimci Sol. With his activities among the students he developed quickly. He began to take on various forms of responsibility. Besides his activities in the university, he was also active as someone holding responsibilities in the areas around Balikesir, Bandirma and Susurluk. He took a direct part in in organising and building various mass activities. Sometimes he was an ordinary militant, sometimes he had specific areas of responsibility. While he was getting to know the Party-Front and the revolution, he was taken captive. Imprisonment was a turning point for Erhan. During his three and a half years in prison he settled accounts with the system. He got to know the Party-Front at a very young age. He experienced heroism and betrayal. In every fibre of his being he sensed that an honourable life was one in which the struggle was waged. He said: “For me the most beautiful and valuable work in the world is to be a revolutionary, a supporter of the Party-Front, and to fight for the freedom of our homeland and our people. For this reason I swear to belong to the Party-Front until my death. For this means to be proud and honourable , so I will safeguard it…” At the end of his imprisonment, he remained true to his oath. He rushed to fight for his homeland and his people. He was full of anger and rage. He expressed his thoughts with the words, ?I have a great urge to fight.” He had begun his life inside the Party-Front and he said, “I am proud of every moment of my life I spent within the Party-Front. ” He was ready to be sent to operate in every area. With his thoughts, his feelings, indeed every fibre of his being. But he wanted to fight, gun in hand. The Party sent him to command the rural guerrilla unit in the Aegean. And with pride in every moment of his life spent inside the Party-Front, on November 30, 1998 he kept his oath until the last breath passed from his body. 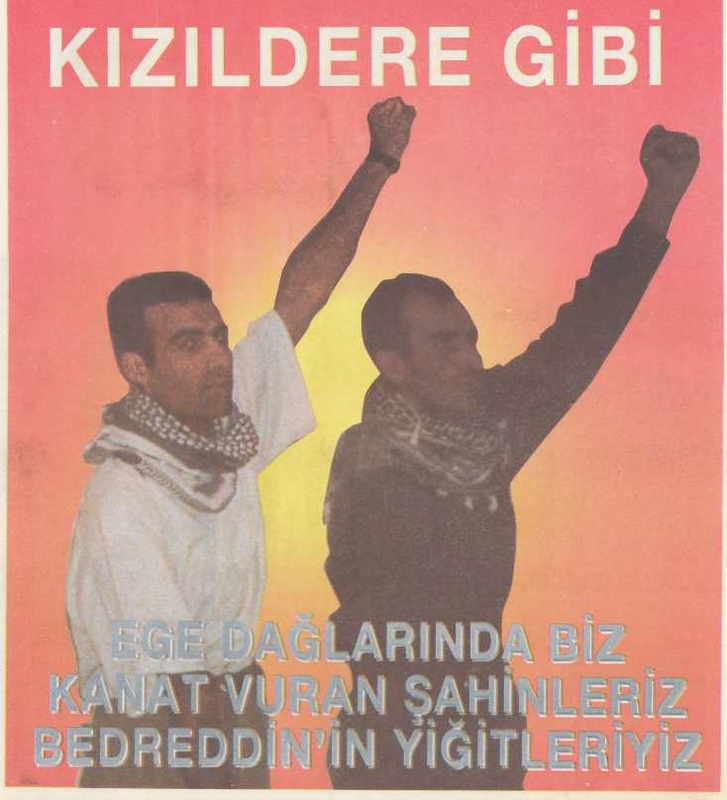 Now in the mountains of the Aegean, the legends of resistance by Erhan and his comrade Mehmet have been written. Erhan’s life is an honourable past , an honourable history of how he stayed true to his word up to his last breath without betraying the Party. Before he went into the mountains of the Aegean, he said: “The days are near in which we will sing the march ‘We are falcons who will beat our wings in the mountains'”. The Party taught him the revolution and a revolutionary personality. He became immortal by holding aloft the Party with his struggle, his life, his resistance, and he sowed the seed of guerrilla warfare in the mountains of the Aegean. He was born in 1964 in Oluklu village in Kagizman district of Kars city, as the child of a poor Kurdish peasant family. Because of poverty he could not continue his education after elementary school. He began to do various kinds of work to earn a living. During his life as a worker he experienced the most typical forms of exploitation and injustice. When in 1993 he got to know the revolutionaries, he very quickly assimilated revolutionary ideas. He carried out various activities in Alibeyköy/Istanbul as a Devrimci Sol sympathiser. For Mehmet, being a revolutionary was something different from his previous life. He wanted to learn all aspects of this life and be a modest soldier of the organisation. He had not come into contact with the dirt and filth of the system. It was his great passion to learn to be a revolutionary and to live that way. The diligence he had already shown in life was now put into service with the revolution. Without making a distinction between major and minor activities, he eagerly carried out all tasks. A little later he came to know imprisonment. This came at an early point for him but it was a school in which he got to know the revolution in all its aspects. He had the self- confidence to say “I can also do what others do”. He was older than many of his other comrades. But he was highly enthusiastic in seeking to learn from his younger comrades and to fight under their direction. He came late to the revolution.He wanted to make up for the years he had wasted outside the revolution. When he was freed he said, “Now I am a fighter and at the service of my Party”. He wanted to dedicate every hour of his life to the Party. For a short time he was in an urban guerrilla unit. In 1995 he was part of a rural guerrilla unit in the Black Sea region. While he was fighting there, he developed severe frostbite and had to be brought to the city to be treated for it. For him being a revolutionary and the struggle was not a short-term thing. It had to last one’s entire life. When he recovered his health, he waited for the order to be sent back to the struggle. He was sent to be deputy commander of the Aegean rural guerrilla unit. When he went into the mountains, he said, “It is our task to keep all the martyrs of the revolution alive, to take their place and to hold their banner even higher and fix it above the fortresses of the oligarchy. I will carry out this proud task to the last drop of my blood as a fighter of the Party-Front…” And he did this. Until the last drop of his blood he shouted out his support of the revolution, the legitimate struggle of the people and the Party-Front. He challenged the enemy. When he drew his last breath along with his comrade Kenan, the fire of resistance burned in the mountains of the Aegean. This fire was lit by them. We give our word that it will grow larger and never be extinguished. THE FIRE LIT BY ERHAN AND MEHMET IN THE MOUNTAINS OF THE AEGEAN WILL NEVER BE EXTINGUISHED!